When I saw these oversized googly eyes in the Target Dollar Spot I knew just what I needed to make. You might have to head to the craft store for some extra supplies. 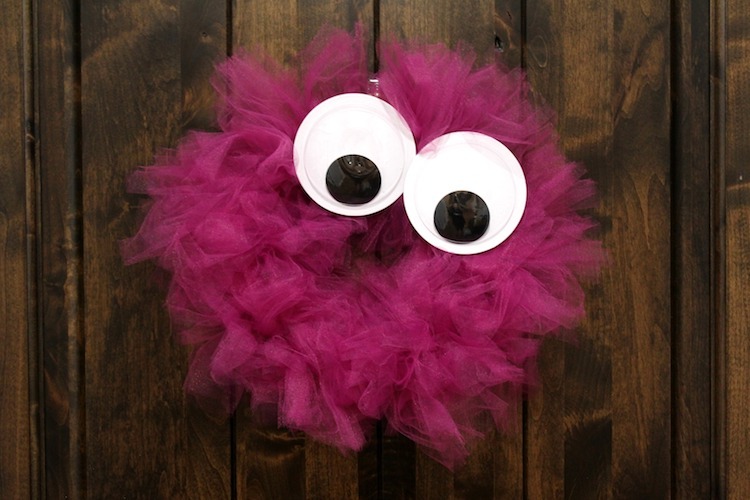 Trust me though, it will be worth it when you have this adorable monster wreath gracing your door. 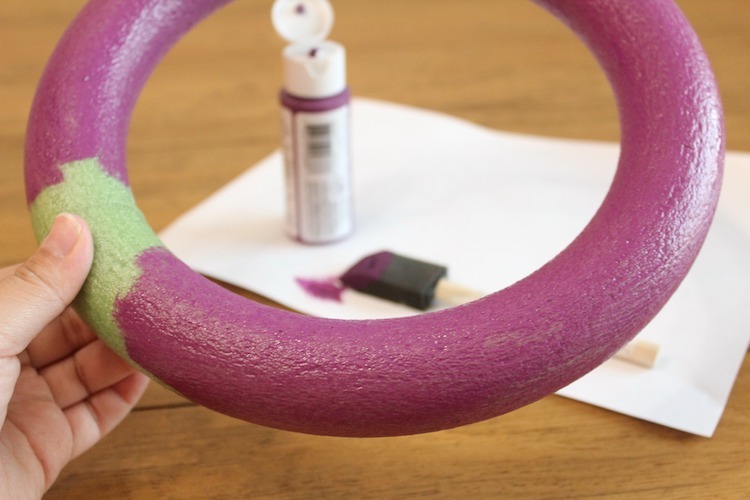 Paint the foam wreath in a color that matches the tulle. Set it aside to dry. Now you’ll want to cut the strips of tulle. 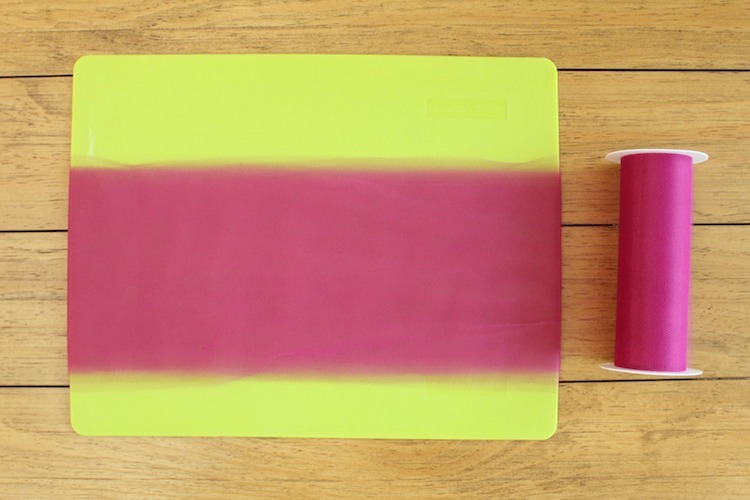 The easiest way to do this is wrap it around something sturdy and flat. I’m using a flexible cutting board that is 14.5″ long. A piece of cardboard would work just as well. 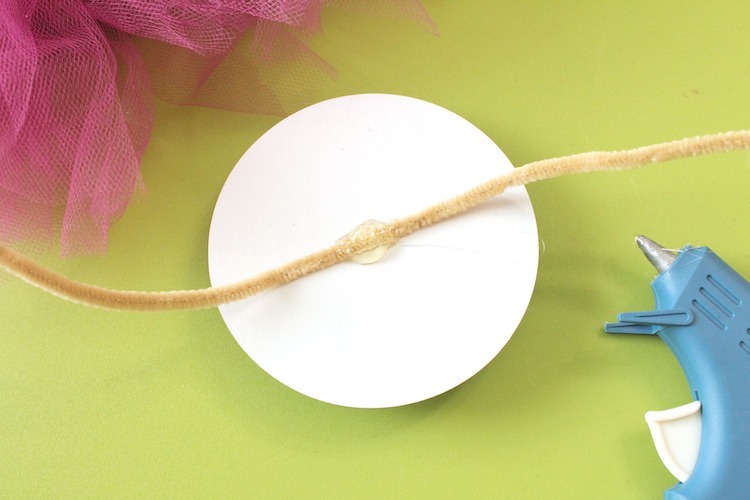 Make a cut at each end and you’ll have evenly cut strips of tulle. I used a 10″ foam wreath and two rolls of 6″ by 20 yard tulle. 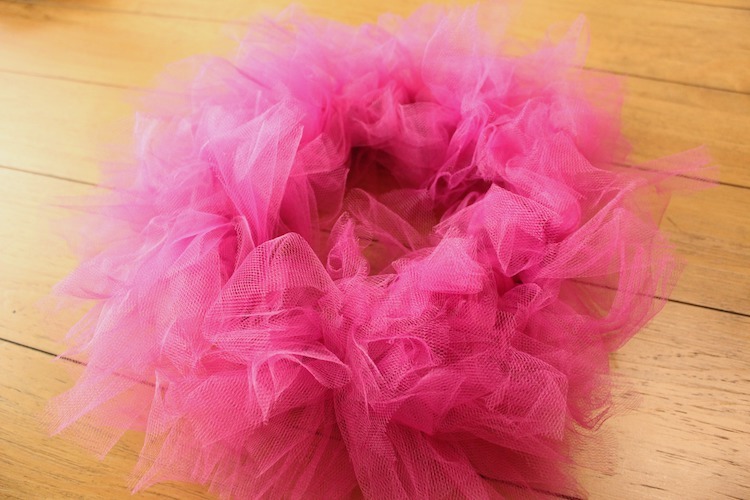 If have a larger sized wreath or want an even fuller wreath you’ll need more tulle. Wrap each strip of tulle around the wreath and knot it twice. Once the wreath is completely wrapped in tulle use your hands to scrunch it up. 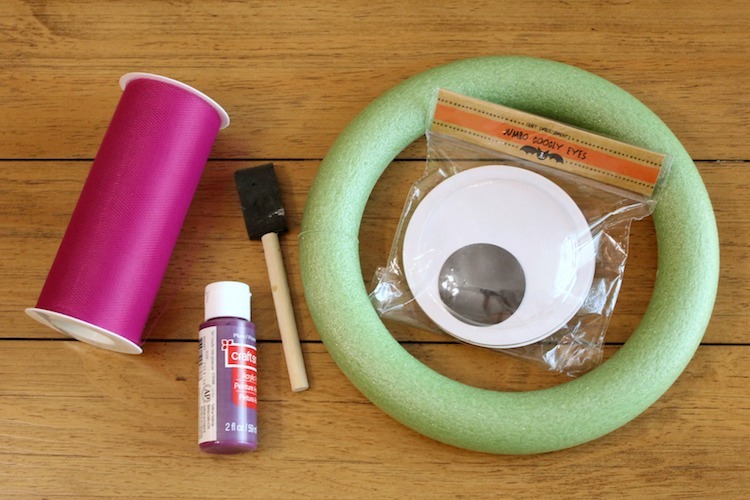 Add a pipe cleaner to the back of each googly eye with a blob of hot glue. Honestly, I ran into some trouble here. It looked like the hot glue was working, but after a minute it just wouldn’t stick to the back of the googly eye. I ended up sticking the hot glued pipe cleaner to the back of the googly eye with a double sided foam mounting square. I don’t know if it was my hot glue being finicky or what. It’s just something to keep in mind in case you run into the same problem. 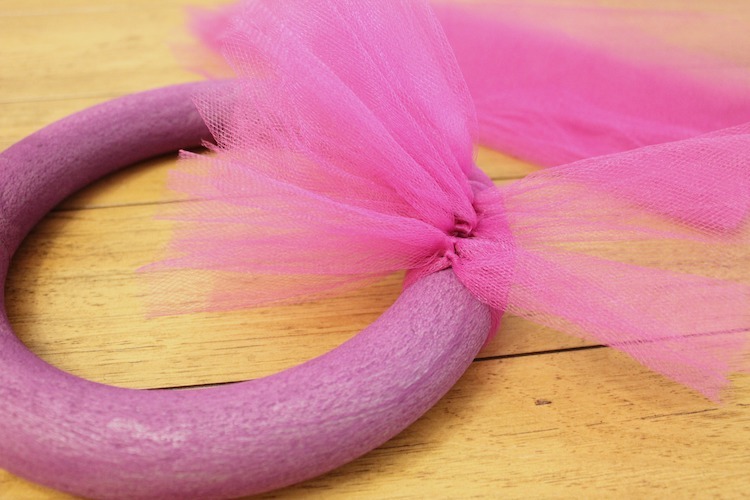 Finish by wrapping the pipe cleaner around the wreath and adjusting the tulle a bit. I love how friendly this little guy looks! If you want a more ferocious looking monster you could add a mouth by drawing one on a piece of foam board. 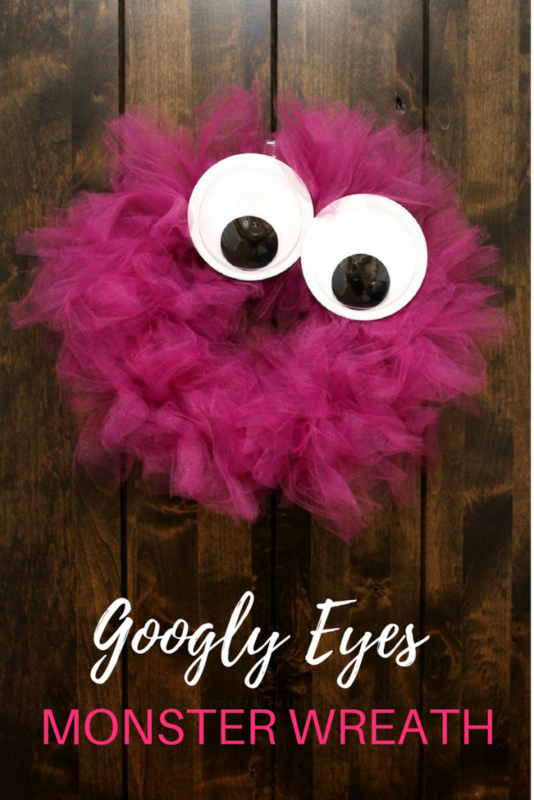 This monster wreath was so fun and easy to make. I see a set of colorful monster wreaths in my future!